One resident makes a huge decision. Max has spent the last few weeks building bridges with his family and doing his best to settle back into normal life. Is all as it seems? Browse content similar to 26/01/2017. Check below for episodes and series from the same categories and more! Mate, what are you just pacing up and down for? -There's a girl under there. -Dad, they know what they're doing. We've already lifted this bus once. Why don't we do it again? Mick, just let them do what they need to do. -Have you rung your brother? Have you tried his work? I'm going to need to ask you to step back, please, sir. Mate, what are you bothering with me for? There's a girl under there. She's hurt. We're doing the best we can to help her. I just need you to give us the space we need to work, OK? I just feel a bit bruised, that's all. Martin, will you just do as you're told for once in your life, please? Oi, you, you listen to your wife. You are going for a checkup. -I want to come with you. -No, you just go to Louise's. I'll call you as soon as I hear anything, I promise. -Did you lock up the shop? -Yeah. He's cleaned the place out. Libby's gone with her in the ambulance. She doesn't want my help. She made that perfectly obvious. Don't you think this has gone on long enough? -You could have lost her, Kim. Emerald, you are going with Kim to the hospital. All right? I'm going to go and check on Donna. At least someone gets a happy ending, eh? Mummy's here, all right? I love you. Mummy's here. Mummy's got you. They are going to be able to get her out, though, won't they? I don't fancy her chances. Let's get it all stabilised down the bottom. Here. I put an extra sugar in it. It's what they do in the movies. Your dad's going to be all right, you know. -I thought I was going to lose you. What the hell is he doing here? Get out! Wait, shouldn't that be, "Thanks, Shakil, for saving my life"? Oh, you love that, don't you? Playing the big man. You'll do anything to get back in her good books. I wish I'd just left you up there. Can someone bring me that stretcher, please? -Let's have a stretcher over here! I'm just going to check you over, see how you're doing, all right? -What is it? What's wrong with her? -Dad, Dad, just give them some space. -Dad, Dad, let them do their jobs. Whit, it's going to be all right. I'm here. It's going to be all right. All right, let's get her onto this stretcher, then. Come on. I'd rather die of salmonella than on a poxy Tube. -What are we supposed to do? -Don't talk to her like that. Yeah, well, I wish you'd stayed there. with a day-old kebab with Joan Crawford and Rin Tin Tin. You going to stump up some compensation? See, I told you something bad had happened. You don't suppose it's Mick, do you? cos you're on the rota tonight. I'm going to get Lee to stump up for a lovely hotel room. You know, room service. You can have the lot, yeah? We'll know more when we get her into Resus. that I'm going to need a trauma team on standby? Oh, they've said it's just a mild concussion. -I'm just waiting to get the all-clear from the doctor. Then we'll wait with you, yeah? There's no need. Libby's in reception, ain't she? You'll do as I say, young lady. -without you lot fussing over me. -What? Showing that we care? Cos that's what family do. So, I suppose you think I brought this on myself? -Yeah, well, look, you said it. Can you just go, please? -I don't even know why you're bothering. I feel fine. -Martin, look at you. You can hardly move. I'm just a bit bruised, that's all. Will you just shut up and wait for a doctor, please? Is there any news on Whit? No, Max said he'd ring me as soon as he heard anything. Loves being in the thick of it, don't he? Excuse me, he just saved your life. The least you could do is be a little bit grateful. Mr Fowler, I'm sorry about the delay. That's all right. No, it's smashing. Can I go now, then? -I'd like you to go for a scan first. We just want to rule out any internal damage. No, I just feel a bit tender. That's all, mate. Tests indicate that you've got some blood in your urine. -It could mean a lot of things. -I wouldn't want to hazard a guess. -Can't you just tell us, mate? We'll know more after the scan. Oh, thanks, love. Decent of you. Oh, fine, if everyone stopped fussing. I think we've got the right to be concerned, don't you? You're lucky. It could have been a lot worse. Makes you appreciate what you've got, don't it? It's Martin who I feel sorry for. He was standing up for the rest of us. -There he is, hero of the minute! Tracey, get that man a drink. He's not the Incredible Hulk. We all helped lift it. But you need someone calm in a moment of crisis, don't you? You done so well out there, Dad. I just did what anyone would do. Orange juice, please. -Yeah, she's been taken away in an ambulance. -Is she going to be all right? -It's too soon to tell. -Anyone seen Paul in Jewellery? -He's over there by the jukebox. Well, at least that's all the stallholders been accounted for. Um, has there been any word on Denise? Yeah, I just called just now. Mild concussion, apparently. I can't help but think this has all been my fault. Why? You weren't driving a bus, were you? I'm the one who got Martin all worked up about the covered market. he could have been a-goner now, couldn't he? There's no need for that now, is there, eh? I could have lost my boys, Kushy. It's going to take more than a stray bus to get rid of us. What happened to the driver, anyway? He had a heart attack, apparently. Poor bloke never stood a chance. it makes you wonder, don't it? -It was just a tragic accident, Mum. Right, the least I can do is get some drinks in, yeah? And I don't want any of you worrying about your stalls. I've already been on the phone to the council. -You don't need to think about that now, do you? Because you lot, you are the beating heart of this market. to make sure that no-one takes that away from you. Thank you. Thank you for everything that you did today. -No, it's all right. Honestly, it was nothing. -No, you saved my market. Well, it don't sound like it's going to be around for too much longer. Please let's not think about that today. Well, at least that lot know you're looking out for them. Yeah. We're like a family. Yeah, you see what happens when you pull together? -Some driver only went and took a wrong turn onto the Square. Yeah, well, I can see that. Is everyone all right? They've taken Whitney, Martin and Denise to hospital. like she wants to talk, but nothing's coming out. 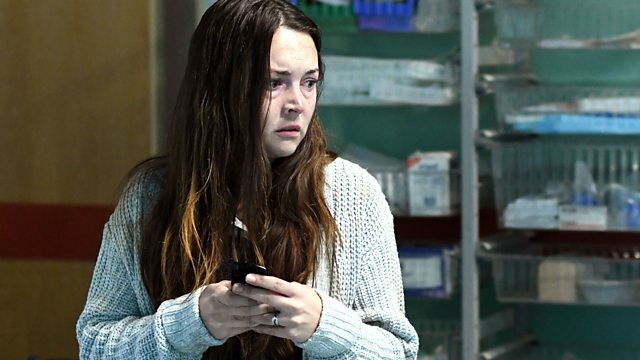 Whitney, you're in Walford General. We're taking you to Resus so the doctor can examine you. -Can you just help her, please? Help her, please. Your wife's in safe hands. -Yeah, just needed five minutes, that's all. it's just taken me right back there. You know, every day, I think, "Today's going to be different." I wake up and think, you know, "You're going to be better." I've just got this dull ache. You know, it's just reminding me the whole time. I remember when we lost Bradley. It took all my strength not to chuck myself off the roof after him. Just gets a bit easier every day, that's all. Jack, you just need time. Got plenty of that, ain't I? And you've got three kids to distract you. I'm so pleased you're back. I mean, I don't know if we'd have got through this without you. Mick. I just heard about Whitney. Is she all right? They've, um...just taken her into Resus. She looked broken, you know. Like the girl ain't been through enough already, you know. Yeah, well, you know, at least she's in good hands. Anyway, how are you getting on? Oh, yeah, well, the doctors have given me the all-clear. I'm just waiting for Libby to come back from the pharmacy. And Kim? Is she not with you, no? Kim hasn't spoken to me since I gave up the baby. Yeah, well, she reckons all this was karma. She don't mean that. That's just stupid talk. Yeah, well, maybe she's right. Maybe this is all I deserve. and that is all that matters, believe me. You know, for not judging me. -It's all right. I understand. What you did took guts, Denise, all right? Real guts. And Kim'll see sense, so don't worry. -Yes? Um, how is she? but she has reduced consciousness, which is worrying me slightly. OK. So, what does that mean? She received quite a blow to the head, Mr Carter. What, like, she could be brain damaged? What? We'll know more when we see the results of her scan. -We're doing everything we can. Want to buy some fags? Go bother someone else, will you, kid? All right. Don't go crying into your tea. Bruv, I thought you said to meet at the chicken shop? so I thought I'd try and flog the stuff in here. Um, you all right, man? How's Whitney? Bruv, the bus that we were on crashed on Bridge Street. Who's Shirley on the phone to? She's trying to get hold of Bianca. A G&T, and don't go skimping on the gin this time. Running in front of that bus with your skirt over your head? Yes, Kim, you are a life-saver. You know me, Kush. Always putting other people first. Unlike someone I could mention. I'll get the drinks in. Can you get Donna another brandy, please? What is it with everyone giving me brandy? I'm going to be legless at this rate. Yeah. Like I've done six rounds with Conor McGregor. How about Denise? She's still in one piece. That could easily have been me and Louie out there. Don't even think about that now. You reckon there's anyone else under there? It was a busy market. Anyone could've been out there. Carmel... Is everyone accounted for? I only checked my stallholders. Listen up, has anyone seen Dot today? Yes, I did! I did earlier. She came into the Minute Mart to get some shopping. -I saw her in the market a few hours ago. I don't know. Towards the tube, I think. I'd better get over there and check. -Is it Dot they're talking about? -Yeah, I dropped her off at her house. We've been to the cinema. Yeah, a bit shaken with what's happening. I promised to look in on her later. It's Mick I feel sorry for. As if things aren't hard enough for him. Let's just say things aren't too rosy with the bank. Now he's got all this to contend with. I need to get this. I'll see you later. No, no, no, it's fine. I'll be there in about an hour. You had us all worried back there. You've got nothing to be sorry about. Johnny phoned him. He's on his way, I promise. Don't worry about things like that now. I just remember it all went black. I was so scared, Mick. All I ever do is bring bad luck to this family. What are you talking about? Why are you even thinking like that? I'm never going to be good enough for him. You're a rock to him. And to me. I just want to be a good wife. Just down there on the right. It's always going to be in here, ain't it? My past. And I've tried to make it work with Lee. Maybe I'm the problem. I'm just so sad all the time, Mick. Lee, he's in a bad place. And we nearly lost you today. So if anything, it's going to make him realise how much he loves you. Denise! Have you seen Whit? Whit! Are you all right? Are you OK? I'm so sorry I weren't here. Listen, if you want to go to Ryan's, we will. All right? Anything you want to do, OK? I'm never letting you go again. Excuse me, have you seen my husband? -I'm sorry, it's not my ward. -He was just laying in that bed, there. They said that he needed to go for a scan. I'll go and find a doctor. Oh, please tell me he's all right. What's the matter? Why are you crying? Martin! I thought you were dead, you idiot! -Hang on, Stace. I've got a bruised abdomen here. Promise me you'll never leave me. Of course I won't, you daft cow. I should get chucked under a bus more often, eh? It's none of my business, Mick. Like I say, Mick, it's really none of my business. I'm going to get you some balloons or something. No, Lee, honestly. I'm fine. I won't be long, all right? Just going to pop to the shop. You know I love L.
I know you do. I know. concentrate on getting you better. Yeah? 'Chelle's just rung, she said she's on her way. So we might as well get going. Will you sit down a minute? -What, am I at school, or something? Look, I want to say something to you. you say no, all right? I want to know that I'll always have a little part of you. We can do it properly this time. and they put, like, a little plan together. I know there are risks, Martin, but...we can do it. We've got a fruit and veg empire to plan for, ain't we? Look, you know I love Arthur, don't you? Yeah? And Lily. I'd do anything for them. Anything. I'd kill for 'em. I ain't. I know what I want. We are, ain't we, eh? We're going to have a baby. 'Hi. This is Max Branning. 'I'm not here right now but please leave a message after the tone. STACEY: 'Max, it's only me. 'I know that it ain't easy coming back here but I'm glad you did. That's where I grew up, over there. Not many people got out of there, believe me. But look at it now. Brimming with potential. Finally it's a place where people aspire to live. The trouble is, too many people have a foot in the past. They can't see the big picture. From what I hear, you're going great guns. You have connections in Walford, isn't that right? No, not as far as I'm concerned. You're a man after my own heart, Max. Never let emotions get in the way of progress. Let it burn, for all I care. Max has spent the last few weeks building bridges with his family and doing his best to settle back into normal life. However, is all as it seems?